You can now win(and lose) the game! I also started putting in sound effects, to hilarious, headache-inducing effect. There are still lots of places that need attention but I won't have much time over the next few days. If necessary, I'll just post a build of what I have so far. It (mostly) works but isn't very fun and far too easy. It rained a lot today, so I actually had a little bit of time to work on the game. 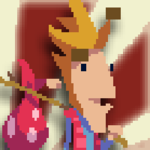 Thanks to the #wizardjam slack, they made me be less afraid of writing shaders. It's used to color the tiles on which a lot of slimes die. Those tiles also give a speed boost to passing jellies, so they might slip by your toughest defenses(or not...). @Ben X Oops, completely forgot about that! The presentation here is great: clear UI, tactile squirmy jellies that pop satisfyingly. I got to about wave 8 and found the best tactic was to spam sniper towers. If there's one thing I'd ask for, it would be a visual representation of how much damage the towers are doing to each jelly so I could judge my options a little better. @Ben X Thank you for the feedback, already made some changes based on it. Jellies now shrink in size as they take damage and I made it a lot clearer when the basic towers are shooting as opposed to just tracking their targets. Today I put in a new enemy type, the...Bloater? As it takes damage it gets bigger until it finally bursts, covering tiles around it in jelly, preventing you from building on those for a short time. 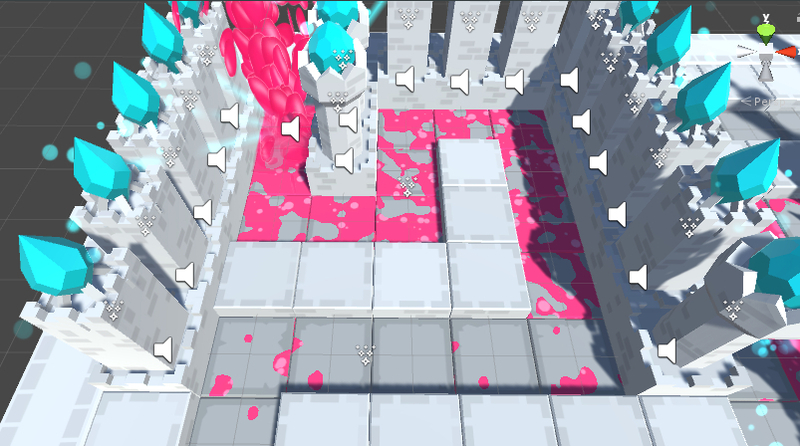 Oh, and area-of-effect towers are now less useless as they slow down enemies within their range, also negating any speed boosts from slimed-up path tiles. I hope to get in a few more interesting enemy types, until now they really were only slightly different magic-missile-sponges. Another enemy type: the Healer. It heals all enemies in range and itself, which can make it quite tricky to deal with, especially when two of them are in range of each other. Atlantic provided me with a "chopped up" version of the music and I built a system which tries to make the music more intense as things get exciting. It's not quite finished though. In addition I increased the amount of sound effects, including 20 disgusting slime effect which I don't know what to do with yet. This is super impressive. I ended up playing it a lot, changing strategies until I found one that worked. I love the contrast between the sterile, marble environment and the goopy slime. Very well done. I uploaded an updated version of the game to itchio, it contains the changes I've made over the last week. There are now also versions for Mac and Linux, although saving and loading levels does not work because I've designed that system with Windows in mind. Not sure yet how easy it'll be to fix. Looking forward to the showcase weekend! Just played through a pre-made level and one that I made myself. This is a really impressive project for the jam. All of your models, shaders, and other particle effects give the game a definite style and feel. An impressive feat! The UI was also clean and easy to understand. My only problem was the UI covering up some of the tiles I could put towers on in a small 8x8 map I had made. Perhaps a small amount of zooming in and out could be possible? I might have also liked some variation in the tower gem colors or something to help me distinguish them after they were placed. The board can get pretty crowded, so some more visual identification help might be nice. Great work on your game, and especially the presentation! I made a commentary-free video of my level creation and playthrough here if you're interested in watching someone else play the game. 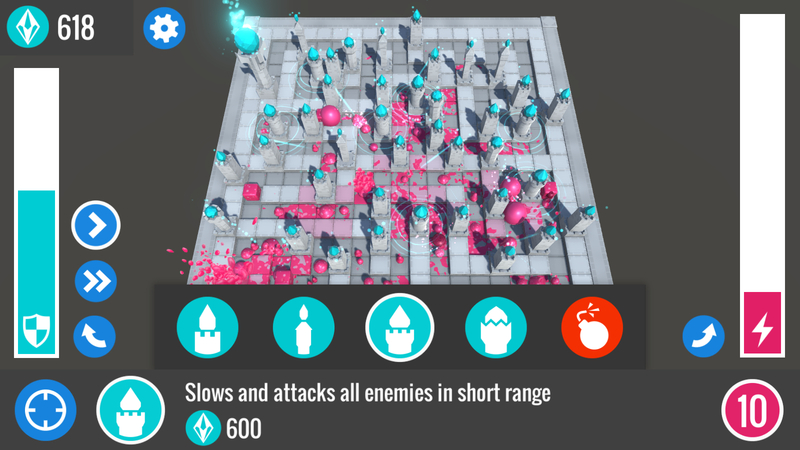 This is a slick little tower defense game. Thank you, @Travis and @ryanfb ! Thank you for recording a playthrough - watching somebody else play is always super helpful! I wrote down quite a few notes on things that need tweaking based on it. I especially noticed that you didn't upgrade any towers...did you actually know about that option? It's mentioned in the help text but not really signposted at all. My only problem was the UI covering up some of the tiles I could put towers on in a small 8x8 map I had made. Perhaps a small amount of zooming in and out could be possible? What aspect ratio did you play at? I built the entire game with 16:9 in mind(not really on purpose), even the camera placement. I wanted to put in the ability to rotate the camera anyway(towers sometimes block the tile behind them). I'll also add a little bit of zoom. I might have also liked some variation in the tower gem colors or something to help me distinguish them after they were placed. The board can get pretty crowded, so some more visual identification help might be nice. Also a good idea! On the white background distinguishing the shapes of the towers is pretty difficult. And the gems are not unique enough either to help there. I want to stay close to the original cyan-ish color but a slight variation might already be enough. I saw elvaq play later and I realized I didn't upgrade at all! Silly of me not to try since I've played plenty of tower defense games. Not sure why I didn't even think about it... I am not so sure I would blame the game over the player in this case. I failed the main levels but had no problem with cool.txt (which I made)! Finally had a chance to play this - it's really well done! Great job! @z_bill and @GammaBit Thank you! I'm glad you enjoyed it. I added some stuff in a little update. Camera controls so you can access all parts of the map, a way of speeding up time to 2x and more detailed feedback in the map editor. I'm not really sure how to fix the balance issue the game has right now, the waves simply do not scale properly. There are some ideas floating around in my head on how to maybe change the game a lot more than is reasonable though. I had a lot of fun with this! It's a very slick tower defence game, and I love the visuals and the music. I enjoyed it more when I made my own level, which turned out to be quite a challenge (Because the enemy spawning is the same for every level, shorter levels tend to be a lot more difficult), and it actually forced me to figure out the best places to put the towers, and when to upgrade them. Like you say, there's no real balance at the moment, but you can kind of make your own balance, with the level editor.